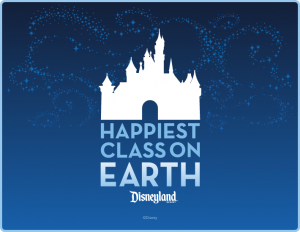 The Disneyland Resort Happiest Class on Earth program encourages and inspires Anaheim sixth graders to give back to the place they call home – Anaheim! Since 2016, more than 9,000 sixth graders at 48 Anaheim elementary schools have given back to their schools and local communities through this program. Last year, students raised over $9,500 to support various causes, collected 1,750 pounds, over 2,000 boxes, and over 1,500 cans of food items, planted more than 66 trees and recycled over 8,000 plastic bottles, just to name a few of their outstanding efforts! Public and private schools located in the city of Anaheim, Calif., with a sixth grade class are eligible*. Eligible schools can complete a community service project and submit a project summary 9/10/2018 – 5/31/2019. Schools can schedule their park visit date through 6/28/2019. Principles of eligible schools will receive an email in September with instructions to participate and other program information. For more information, email: DLR.Corporate.Citizenship@Disney.com. *Program offered to sixth grade classes at select public schools in: Anaheim Elementary School District, Centralia Elementary School District, Magnolia School District, Orange Unified School District, Placentia-Yorba Linda Unified School District, and Savanna School District as well as private schools located in Anaheim, Calif. Not offered to independent study (home-based or online) public, private or charter schools.